I almost reported on this "massacre" a couple of weeks ago. I'm glad I held off. Reported Venezuelan massacre didn't happen, activists now sayThe nonprofit that pushed last month for Venezuelan officials to investigate reports of a massacre in an Amazon indigenous community said Monday that it now believes there was no attack there. 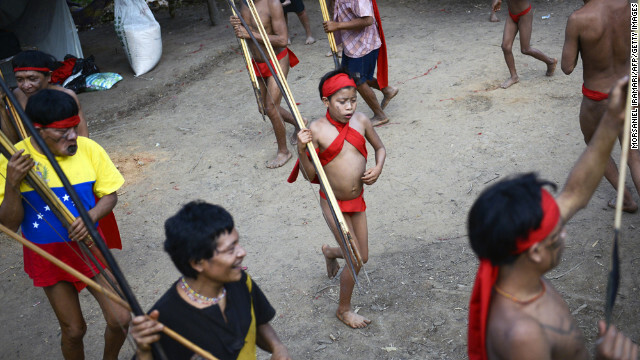 "Having received its own testimony from confidential sources, Survival now believes there was no attack by miners on the Yanomami community of Irotatheri," said Stephen Corry, director of Survival International. The statement comes after Venezuelan state media over the weekend published several reports detailing officials' accounts from the area, also concluding that no massacre had occurred. An aerial flyover and ground operation to the community in a remote region along the Brazil-Venezuela border showed no signs of an attack, Venezuelan Brig. Gen. Jesus Zambrano told state-run VTV. "We can testify that nothing happened," he said. Investigators "also visited other communities in the region, before reaching Irotatheri, and also nothing happened there." On Saturday, Venezuela's government ombudswoman said the report was fueled by second-hand hearsay. "It was a false, biased report," Gabriela Ramirez told reporters. "The report was made by an indigenous person that heard that another organization had said it. "Comment: Another case of botched reporting, but this time the blame falls squarely on Survival International. One Indian heard it from someone else...and you reported it as fact? You had no eyewitness testimony--indeed, nothing but a third-hand report? Wow. Next time, try checking your sources before alarming the world about a potential atrocity. Try to get at least a secondhand report--e.g., "He described the dead bodies to me in vivid detail." A third-hand report is basically useless as evidence. For more on the subject, see Firth Video Generates Protest E-Mails and Sunday Night Probed Over "Freakshow." Below: "Yanomami natives perform a ritual dance at an Irotatheri community, located in southern Venezuela near the border with Brazil, on September 7."